Chicago, IL (December 4, 2015) -- Kartemquin Films today unveiled a calendar of events and activities that will occur throughout 2016 to mark the organization’s 50th anniversary. The not-for-profit documentary production collective, founded in 1966 by three University of Chicago graduates and best known for producing socially impactful works such as Hoop Dreams, The Interrupters, and the Roger Ebert biopic Life Itself, also announced two significant grants totalling $1million over the next two years. Highlights of the 50th anniversary year include several retrospectives and screenings in Chicago and nationwide; an art exhibit; monthly television broadcasts; an academic book; workshops, panels, and master classes; and online streaming of the organization’s entire catalog of award-winning documentaries. The calendar, which will be updated throughout the year as new events and partners are added, is available at www.kartemquin.com/KTQ50. The centerpiece event will be a public gala titled “Milestones” to be held at Chicago’s Harris Theater on Friday, June 24th 2016. The event will reunite filmmakers, subjects, and prominent partners, fans, and alumni from across Kartemquin’s five decades for a celebration of the significant moments they have shared in creating over 55 different films since their founding in 1966. Chaz Ebert, President of The Ebert Company Ltd, and Publisher of RogerEbert.com, will serve as the honorary chair of the evening, which will be preceded by a dinner reception at the Chicago Cultural Center. “The impact of Kartemquin on Chicago is hard to overstate. They stand as a cultural institution all local citizens should know and be proud of, and we’re delighted to celebrate their commitment to serving artists and our community,” said Michelle T. Boone, Commissioner, Department of Cultural Affairs and Special Events (DCASE) for the City of Chicago. Boone announced that the city would host a 50 years of Kartemquin Art & Filmmaking Ephemera exhibit at Expo 72 featuring walking tours and a curated selection of Kartemquin’s historical photographs, artwork, and video and film mechanics. The exhibit will open May 28, 2016 and run through August 21, 2016. Former Executive Director Justine Nagan, recently appointed as Executive Director of New York-based American Documentary, Inc, launched the organization into new fundraising territory during her eight years of leadership, increasing the annual budget from $800K in 2008 to $3.5million in 2016, with a corresponding record growth of films in production and expanded programs to assist filmmakers. Nagan recently worked to secure substantial grants to ensure the organization will begin the next half century in a position of stability. 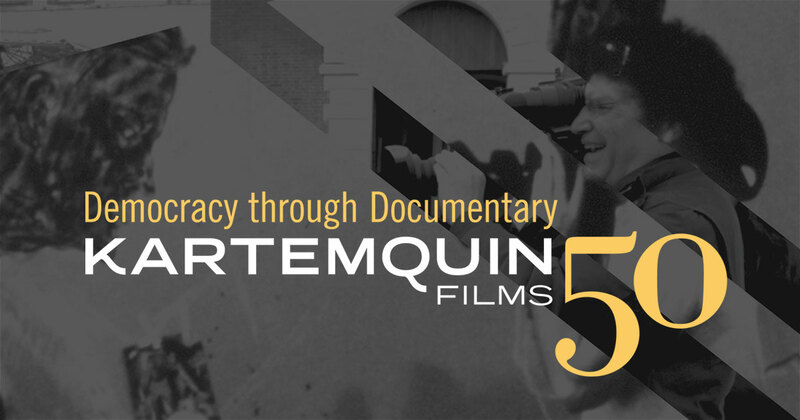 Kartemquin will receive $500,000 from The John D. and Catherine T. MacArthur Foundation over two years for leadership and infrastructure support, 50th anniversary celebrations and filmmaker services. The Sage Foundation is providing $500,000 over the next two years for general operating support, 50th anniversary celebrations and significant seed funds to launch a new initiative that will be announced at Kartemquin’s June 24th Milestones gala. “We are thrilled to announce major grants from longtime partners investing in the future of Kartemquin Films, aimed at enhancing our ability to serve a thriving midwest documentary film community,” said new Kartemquin Board Chair Jason Stephens. “These grants mark a notable transitional shift for the organization and the local documentary film industry,” said Adrianne Furniss, Chair of the 50th Anniversary Committee. "With $600,000 of these two grants coming in 2016, our fundraising goal is to secure an additional $400,000 next year to raise a total of $1 million dollars during our 50th anniversary, all going towards supporting documentary filmmaking." Programs that will be supported by the grants will include a continued commitment to public media advocacy. Recent initiatives Kartemquin has led include forming the Indie Caucus, a coalition of filmmakers that works to ensure the the health of documentaries within the public media system, and securing a renewed DMCA exemption to allow all documentary makers to exercise their “fair use” right to employ copyrighted footage in their work. These initiatives were spearheaded by Artistic Director and co-founder Gordon Quinn, who will be honored with the International Documentary Association (IDA) prestigious 2015 Career Achievement Award on December 5th in Los Angeles. Previous winners of the illustrious IDA award include Robert Redford, Werner Herzog, Barbara Kopple, and Michael Moore. Kartemquin’s Hard Earned, a six-part series on people living on the minimum wage, is also IDA nominated for Best Series, and re-airs on Al Jazeera America starting Dec 20th. Another award-winning new film, Almost There, opens in theaters on December 4 in NYC, and Dec 11 in Chicago and Los Angeles. Kartemquin currently has over 12 projects in production. For the 50th anniversary of Kartemquin Films, we celebrate our legacy in Chicago and beyond, and look forward to another 50 years of innovative and impactful work. Several organizations in Chicago and around the country will host a series of screenings and events to celebrate Kartemquin’s work, and the power of documentary to inspire action. A complete listing of the year’s events will be available at www.kartemquin.com/ktq50. Join the conversation on Twitter at @Kartemquin or by using #KTQ50. A complete listing of the year’s events will be regularly updated at www.kartemquin.com/ktq50. Join the conversation on Twitter by using #KTQ50. A Milestones gala event on June 24, 2016 at the Harris Theater, preceded by a dinner reception at the Chicago Cultural Center. This evening will reunite and celebrate many of our filmmakers, subjects, and partners from across five decades. The Honorary Chair is Chaz Ebert. Contact Mo@kartemquin.com for tickets and sponsorship details. A 50 years of Kartemquin art & ephemera exhibit at Expo 72 featuring walking tours and a curated selection of KTQ’s historical photographs, artwork, and video and film mechanics. The exhibit will open May 28, 2016 and run through August 20th. A series of Chicago screenings and events at the Chicago Cultural Center, the Gene Siskel Film Center, University of Chicago, Free Spirit Media, Chicago Filmmakers, CTVN, Southside Projections, Block Cinema, and more. Various workshops, panels, and master classes throughout the year hosted by Kartemquin filmmakers and associates. Free online streaming of every Kartemquin film in chronological order week by week at http://watch.kartemquin.com, starting with the very first film, Home for Life (1966), on January 1, 2016. Throughout 2016, monthly WTTW PBS broadcasts of our films beginning with a broadcast of The Homestretch (2014) on January 21, 2016, The Trials of Muhammad Ali (2013) in February 2016, and Now We Live on Clifton (1974) & Winnie Wright, Age 11 (1974) in March 2016. The January and March presentations will be preceded by free public screenings in Chicago. Multiple retrospectives and new screenings across the nation, including at the UCLA Film & TV Archive in Los Angeles for fall 2016. A book on Kartemquin’s work and legacy. Kartemquin is a collaborative center for documentary media makers who seek to foster a more engaged and empowered society. In 2016, Kartemquin will celebrate 50 years of sparking democracy through documentary. A revered resource within the film community on issues of fair use, ethics, story and civic discourse, Kartemquin is internationally recognized for crafting quality documentaries backed by audience and community engagement strategies, and for its innovative media arts community programs. The organization has won every major critical and journalistic prize, including multiple Emmy, Peabody, duPont-Columbia and Robert F. Kennedy journalism awards, Independent Spirit, IDA, PGA and DGA awards, and an Oscar nomination.